This is my papier mache reindeer I have been making to hang on my wall at Christmas. I haven't come up with a name for him yet. When he is finished I am sure something will spring to mind. Archie and Hugo are going mad on all of the roses in the garden. I think they are very well-rounded farm boys. Jonno is working again this weekend so the boys and I have been pottering around home. Archie and Hugo were spellbound by an experiment we made, picking daisies and popping them into jars of different coloured food dye and water mixes. We were amazed by how quickly they changed colour (less than an hour). And most importantly, our very, very, very special next-door-neighbour/babysitter is having her 17th birthday today. The boys completely and utterly adore her (as do I) and so set to work making a card for her. She has started a blog which I will put up on my sidebar but for now here is her link. I had to take a photo before they climbed the hill to our neighbours. 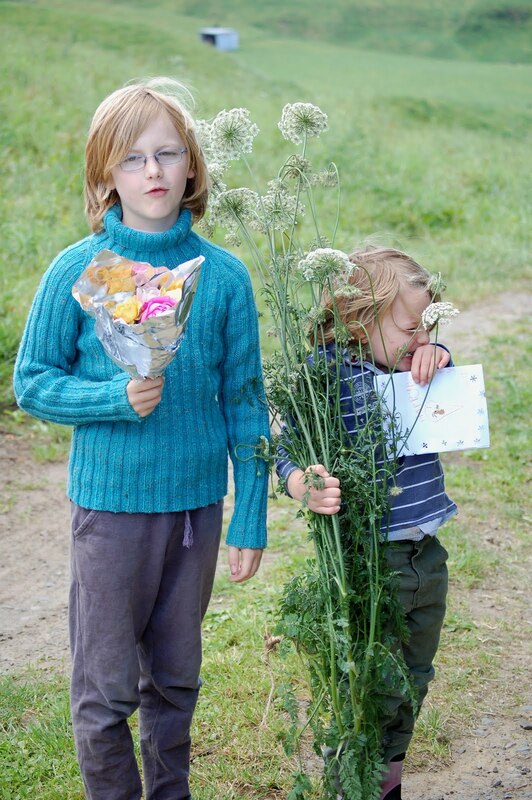 Is there anything more sweet than a five year old boy carrying a bunch of flowers taller than him. Maybe an eight year old self consciously holding a bunch of roses. I do have lots of things to show you and a few more christmassy ideas that are swirling around my head, but for the moment, I will make do with showing you a few little bits from the past couple of days. My roses are finally in full bloom and I have been cutting as many as possible. My yellow rose above, 'Golden Celebration' has produced its first few blooms and I would now say that it is my favourite yellow rose ever. I can't wait for when it coincides with my 'Blue Moon' bush. I have been steadily working on presents but am beginning to get that feeling that whatever is made is unravelled over night by pixies as I don't seem to be getting through the list very quickly. I have however, finally finished the hexie cushion over the weekend and it has been put into good use since. Somebody's bottom has made good use of it I can see. Thursday night is always a little bit nice as Jonno plays cricket, the boys go to bed early and I get a some t.v. crochet and couch time to myself. There is something so luxurious about it... oh yes and I don't cook. The boys and I have a breakfasty sort of a dinner which takes the pressure off too. p.s. The boys have been obsessed with 'The Labyrinth' for a while now and especially with David Bowie who they think has a very fine singing voice. Hugo just said to me then.... "David Bowie is famous because he can walk up walls and ceilings". I love how David Bowie has a secret life and is a hero to a new mini generation. I love my little teensy tiny and very old fashioned rose. The only problem is that they are too small to go in even my smallest vase so what to do with them - pop them into a miniature salt shaker which a friend gave to me a long time ago. This week has been very quiet. Archie recovered well from his bout of croup but we have all been left pretty exhausted. Usually I can't wait until night time when the boys are in bed, the really good shows have started on t.v. and I can dive into a project. However, over the past few nights I have been lying aimlessly on the couch, counting down the minutes until I can slink off to bed. Last night my lights were out before 9pm - unheard of!!! So not much to offer up on the making front I'm afraid. Hugo and Jonno have been busy though. Hugo decided to make another butterfly house with my cake cover and became very frustrated after setting it up nicely with flowers and leaves, when he couldn't find anything to occupy it. Jonno is such a nice dad that he snuck away, found a cutting stamp/thing and some pink cardboard and made butterflies. He then filled up Hugo's net and came into the room shaking them up as though they could really fly. This is my only contribution to creativity this week. A stripy back for my hexie cushion. This post is being written from bed. It is mid morning and there seems little point in rushing around. I have an addictive book, Gabrielle Hamilton's 'Blood Bones and Butter', clean sheets, boys doing farmy things with Jonno and a headache. I ask you... what would you do? I have been waiting for so long to put this post up that in the end I almost forgot to do it at all. That's the problem with finishing a present for someone and then having to wait until they receive it. This is a scarf I knitted for my Dad at the beginning of October and thanks to my non-existent posting ability, he has only taken possession of it now.... just when Melbourne is beginning to enter its hot months. Still, it will be in pristine condition for next Autumn. I found this pattern on ravelry which appealed to me straight away as it is a very easy cable for a beginner and has such a snuggly finish. To make it extra warm and soft I used Sublime Cashmerino in an aran weight. And I think was quite crestfallen when I suggested he take it off - actually I think he is just looking at his little toes, maybe checking out what he had for breakfast. Over the weekend we had our school's inaugural quiz night with a country and western theme. I was put in charge of our decorating and decided to go for a very subtle prairie look (keep in mind that this is an interpretation of an Australian living in New Zealand). I recently visited a friend who had been making Christmas decorations with air drying clay and used that inspiration for my own purposes. The above tiles were made by using a normal rubber stamp and and ink pad, pressing firmly to create an embossed look. I also made a few mini tiles for myself to use as present labels. I then went to the $2 shop and bought a few kitschy decorations to scatter around the flowers (Archie had great fun setting this up at the venue), paper doilies for a little bit of lace and some cotton gingham squares. For the flowers, I gathered as many weeds - clover, grasses, queen anne's lace, dandelions, wild roses and seed heads as I could and then combined them with a big bunch of beautifully scented sweet pea. Hugo thought it was amazing and was very keen to work so I set him to filling jars with water. For the outside veranda I used sedums (a perennial succulent) and tucked glow sticks into them so that they would look a little fireflyish - I thought by replacing candles with glow sticks might prevent a few spot fires. A fire is always such a bad way to end a quiz night I find. And guess what.... our table came 2nd!!!!!! This is where I will sign off. I am a little tired tonight as poor old Archie had a terrible night with croup. We almost rushed him to hospital but just as I was dressed and ready his breathing returned to normal thank goodness. A very early night to bed for us all methinks. p.s. I haven't proofread this as I am too tuckered out so I hope it all makes sense.